Discussion in 'Cat Health' started by proudwing, Aug 10, 2018. My cat has a wound on one of his hind legs, where the joint is.. i guess you can call it the ankle on cats? It doesnt have any fur there and its just pink and I was told it usually happens when they age. But last week i noticed some dots of blood on my floor and when i checked my kitty his ankle is bleeding! Anyway i did some wound care and put in on bandages. It stopped the bleeding but a few days ago my cat started to take off the bandages on his own when im sleeping. And when it’s off, he will groom/lick on the ankle and im afraind it will bleed again. Right now the wound just looks pink and its a bit wet but its not swelling. I will take a pic later. Is there anything i can do to speed up the healing of this wound? Please help my cat. You can go to a local vet and ask for a cone of shame. They may charge you a few bucks but you can put it on at night so he doesn't take off the bandage. You can use neosporin on cats in small amounts but i would not recommend it without seeing a vet. I just went to the vet two days ago because of a wound on my cat's paw. Cost $200 because it started to swell and it got bad. I would advice that you get a cone asap. Licking that ankle will make a lot worse. My vet told me that the wound on my cat would have healed on its if she didn't lick it and get it infected. Just keep an eye on it and if it starts to swell then take her to the vet asap because that means she's getting an infection. Is their still a scab and open wound? If not, I would let him be. If he is reopening it then get the cone of shame until it is healed. He will hate it but it needs to heal. Cats do heal very quickly so he should only need to wear it for a few days up to two weeks. Here is the pic. Please help. I think the wound is starting to scab on the edges? Yes i just bought him a cone of shame. Will put it on him tomorrow. Shall i just let the wound be, no bandage or anything? Thank you. That would still be considered open IMO. Or at least fresh enough that he could cause problems. Seeing it, I'd recommend a vet visit, it looks like the wound itself is a secondary problem with the primary being what caused it. Your vet would be able to determine if it is just a wound that grew or something more serious along with perscribe a cat friendly topical cream to help it heal properly. In most cases, you can do a very thin layer of non medicated Neosporin and keep it clean. But you don't want a reoccurrence so getting to the root of the matter is important. i wouldn't bandage it if he is in the cone. as long as he can't lick it too much it should heal. the picture is hard to see. its not green or purulent correct?? Could fleas have caused this? He had a nasty bout but its cleared now. is it oozing pus at all? Do you know what caused the wound?? It seems unlikely that fleas would cause that. Typical hair loss from fleas starts around the base of the tail. Bug bits will usually be on sides or less moving body parts. Right on that joint makes me think contact with something external (a cleaner for example) or an internal problem that is causing surface discomfort (like arthritis for example). Small amounts of hairloss at that spot isn't uncommon but it's a little beyond what I am comfortable with. I honestly am thinking some type of rash he scratched too much. Obviously, not a vet and haven't seen it in person. But in finding out you'd be able to prevent or limit reoccurance. My boy has a bad habit of rolling in ant hills/lines. I don't know why, but he gets bit by ants all the time. I know what his bite marks now look like and how to treat at home, but the first time I took him in for treatment and to confirm at what point it needs vet care. Yours is just a little bigger then I'd feel comfortable with leaving without a vet check. It probably would just be the exam fee and you can always ask if Neosporin alone is treatment enough. Hi again everyone. Sad to say the wound still looks the same. I took him to the vet after i initially posted and they just gave him some topical antibiotic that he must never lick and another topical cream. Says to put a cone or make sure his leg has a bandage on when putting those. I asked what could have caused it and they said its probably a pressure wound and since my cats’s a bit old (he’s 11). They didnt ran any tests though (vets here arent like the ones in the US, unfortunately). I’ve had no luck with cones so far. He was able to get out of it within 5minutes. And one instance he kicked and trashed the cone so hard that the cone had blood on it from the wound. Bandages dont work if i take my eyes off him because he’ll just chew it off. So im ashamed to say i wasnt able to put the antibiotics anymore because im afraid of what will happen if my cat manages to lick it. Please help me. I honestly dont know what to do anymore. Im working and have noone else to look after him. 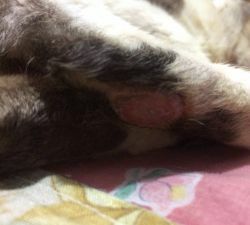 Vet says the wound will heal on its own if only the cat wont bite/lick it anymore. And i did notice the wound got smaller when my cat didnt touch it for like 4 days. But now he’s back at it. I’ve tried moringa leaves as well thinking it might be bitter for him but to no effect (or maybe i didnt put it enough times). Like i said i have work My cat eat, drink, poop and pees just like normal. Only problem is this wound. My last resort is a bitterant spray. We dont have that here in the Philippines so im ordering online. Until it arrives, please, anyone, help me with some advice. Im trying my best to take care of him even missing some days off work but nothing’s improving. Your cat is licking the wound..........because it hurts ! This is what explains the frantic tearing off the cone.....and, chewing off the bandage. IF you get him a pain med from the Vet, I can almost guarantee that he will leave the wound alone. Now, once he ignores the wound, there's still the possibility that he may groom himself around there..which means licking. Once he is pain-free, I would use a bandage to cover the wound, putting the creams on beforehand. Don't apply a "bitterant spray" to the wound.....it will cause more problems than you have seen so far.......BUT, after the pain med and after bandaging, THEN you can lightly spray the bandage itself. Vets also use elastic covers for bandages....you might ask about these. It should not be too tight, just enough to be held in place. Keep us posted..............oh, and soon you'll be able to take a deep breath! Oh i did not think of pain meds. Alright i will ask the vet about it tomorrow (its night time here). Hopefully it will help. Thanks for the tip about the bitterant spray. So sprays like Wound Gard isnt to be applied on the wound itself? Wound Guard is OK - there are other products which are 'simply' repellents and these could severely irritate an open wound, and those are what I thought you meant. Wound Guard contains antibacterial and antifungal agents plus 'has a strong bitter taste that dissuades the animal from licking/chewing' - that wouldn't cause any problem/issue. Still, you have the Vet's creams to use....so, I would just use the 'bitterant' on the outside area on and around the bandage.